The tower and spire of the Holy Trinity Church was erected in memory of the soldiers, sailors and nurses from Orange who served in World War One. 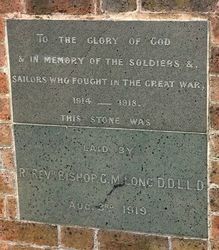 The foundation stone was laid by the Bishop of Bathurst on August 3, 1919, but the high cost of building prevented the execution of the work until 1925. The addition of the tower and spire to the Holy Trinity Church at Orange is a further step towards the completion of the fine brick church designed by the late Colonel Rowe. The present building commlttee of the church has decided to complete this fine edifice as a suitable memorial to the soldiers, sailors, and nurses from the Orange district who served in the War. It is the ultimate intention of the committee to install a carillon of bells in the upper portion of the tower, which has been specially designed for this purpose. 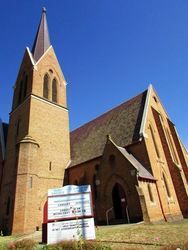 The architects are Sir Charles Rosenthal and Day, of Sydney, and the builder is Mr. L. Pither of Katoomba. The foundatlon-stone for the tower additions were laid by the Bishop of Bathurst on August 3, 1919, but the high cost of building prevented the execution of the work until the present time. Sydney Morning Herald (NSW), 13 May 1925. THIS STONE WAS LAID BY Rt. REVd. BISHOP G.M.LONG D.D.L.L.D.